It’s Thursday evening and the weekend is approaching. It’s therefore time to warm up with some nostalgic point-and-click gaming through ScummVM. For those of you who are unfamiliar with ScummVM, it’s basically an application that lets you run certain old adventure and role-playing games on systems they were never designed for. Examples are legendary titles like The Secret of Monkey Island, Maniac Mansion, Full Throttle and Sam and Max Hit the Road. AmigaOS 4 does have a port of ScummVM and it works great. The current version is 1.8.1 and was released on the 27th of May 2016. The AmigaOS 4 maintainer is, as far as I can see, a developer by the name Raziel. Having ScummVM on AmigaOS 4 opens up great possibilities, since you can run stuff that never came out for the Amiga. A very popular example is the awesome Monkey Island 3, which I will be testing in the future. 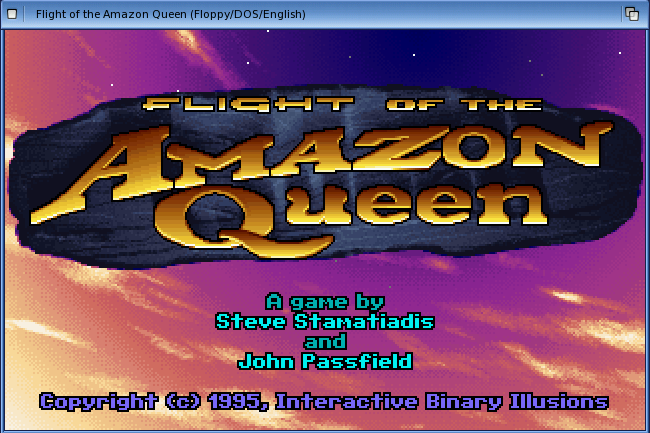 Even if it does look like I’m only going to write about ScummVM, I’m actually looking into the point-and-click classic Flight of the Amazon Queen. Once it has finished downloading, unpack it to a directory of your choice (right-click icon, choose “extract to”). When you’ve gotten hold of the games you want, you can start adding them to ScummVM. To add, click on “Add Game” and select the directory where it resides. There’s not much more to it than that. Afterwards you are ready to start playing. As you can see from the screenshot, I’ve only got two games listed, but you can have many, many more. FOTAQ is, as mentioned, an adventure game in the style of Monkey Island. It was originally released for the Amiga and PC/MS-DOS back in 1995. It was then re-released as freeware in 2004 for use with ScummVM. I’ve heard that it was developed with AMOS, but can’t confirm that this is true. In the game you play the character Joe King, who is a pilot for hire. He was hired to fly a famous actress to a gig, but crashed deep in the Amazon Jungle. Here he uncovers a sneaky plot by a mad scientist to take over the world by creating an army of dinosaur women made from Amazon women. The game kicks off with a nice intro. You are captured together with the actress, but are rescued by Sparky the Mechanic. Later on your locked in a hotel room, unable to get out, and must find a way to escape. Since I’m not new to the game, I know what you’ll have to do to get out. Pick up the sheets, tie them together and hook the “rope” onto the radiator. You can then slide down the hatch. You’ve managed to escape the room, but now what? I won’t get into details here, as discovering it is all the fun! As is customary with these point-a-click games, you have an interface at the bottom of the screen. Here you can choose to “pick up” objects, “open” doors and so forth. You also have icons of items on display. These you can combine with on-screen items or characters. You use the mouse to click on where your character should go and what to do. It’s worth mentioning that you can press “Escape” to skip cut scenes. Sometimes this is handy if you’ve already viewed it several times. So, is it any fun? That’s a good question, but the answer is short… FOTAQ is VERY fun. It has great humour, jokes and a cool story. You’ll encounter many absurd situations and characters, but I won’t disclose any of that here. If you enjoy adventure games, you’ll have a great time. The graphics looks really nice as well, which is a big plus. To sum it up, I highly recommend getting ScummVM for your AmigaOS 4 setup. It is so worth it! You’ll get access to many superb games free of charge! Once ScummVM is up, do yourself a favor, grab the talkie version of FOTAQ and get cracking. 😉 Enjoy and thanks for visiting my blog. See you soon! PS: There are several ways to run this game on AmigaOS 4. You can also run it through RunInUAE for example if you favor that. Just mentioning it in case some of you prefer such an option. 🙂 If you do, then you need the ADF’s of the game. Here you can find them. Cheers! Hi there ChrisH! Many thanks for for the helpful information and of course for your job on RunInUae. 🙂 Cheers!